Archers Sleepcentre is a value led bed retailer selling beds and mattresses in high volumes throughout the UK. 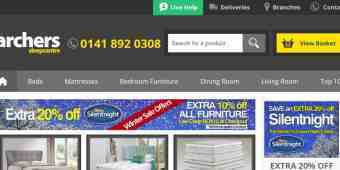 Archers Sleepcentre has bed superstores from Ayr to Edinburgh. At the Archers Sleepcentre web store you find a large offering of the leading internet bed brands. Verified two days ago. Valid until further notice. Archers Sleepcentre discount code not required.